Status: Uncommon regular spring and fall migrant statewide. Documentation: Specimen: UNSM ZM6625, Sep 1892 Lincoln, Lancaster Co.
Taxonomy: Four subspecies are currently recognized (Gill and Donsker 2017), two breeding in central to eastern Asia (tibetana and minussensis), one in Siberia and northeast China (longipennis), and the fourth (hirundo) in the Western Hemisphere, Atlantic islands, Europe and west Africa to China. Nebraska birds are presumed hirundo. Migrants pass through mostly in mid- to late May, peaking in mid-May, with a few still moving through in early to mid-Jun. One of the last dates above was of an alternate adult photographed at Tamora WPA, Seward Co 21 Jun 2014. Documented records for Nebraska are in the period 10 May-21 Jun, with additional early records 30 Apr 2018 at Lake McConaughy, Keith Co, 1 May 1999 at Oliver Reservoir, Kimball Co, 2-9 May 2008 Douglas Co, and 4 May 2005 at Swanson Reservoir, Hitchcock Co. The dates in Jun are likely two-year-old birds, which often migrate to breeding colonies, arriving in late Jun, and sometimes actually breed; one-year-olds usually remain on the wintering grounds (Nisbet et al 2017). The only spring specimens for Nebraska are a pair, HMM 2976, collected 14 May 1924 at Kearney, Buffalo Co.
High counts: 32 at Lake McConaughy, Keith Co 27 May 2011, 14 there 18-19 May 1997, and 13 at Lake Minatare, Scotts Bluff Co 16 May 2006. The only record in the period 22 Jun-20 Jul is of four adults in atypical (marsh) habitat in Fillmore Co 3 Jul 2015. 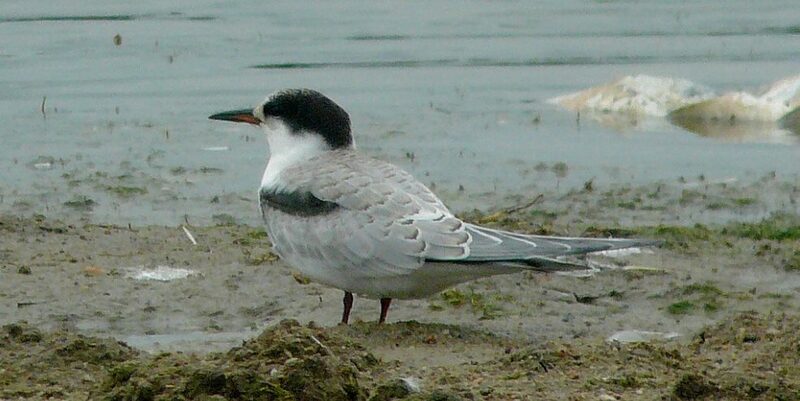 These were apparent early migrants and possibly failed breeders. Peak migration probably occurs in mid-Sep. There are later records 24 Oct 2015 Harlan Co Reservoir, Harlan Co, 25 Oct 1997 Conestoga Lake, Lancaster Co, 26 Oct 2007, adult and juvenile, Branched Oak Lake, Lancaster Co, and 2 Nov 1997 Lake Alice, Scotts Bluff Co (Brogie 1998). Documented Nebraska records fall in the period of 22 Jul-2 Nov, including several of juveniles with and without adults, the latter usually in molt. The only known fall specimen for the state, cited above, was taken Sep 1892. High counts: 23 at Lake McConaughy 8 Sep 2000, 18 there 7 Sep 1998, and 11 at Lake Minatare 14 Sep 2001. Comments: Few reports of Common Tern are well-documented and the species can be difficult to distinguish in various plumages from the more numerous Forster’s Tern. In Oklahoma, Sutton (1967) collected 30 terns with the general appearance of the Common Tern in an effort to obtain a specimen, but all were Forster’s. Breeding occurs as close as northeastern South Dakota, where it is considered a fairly common migrant (Tallman et al 2002). Photograph (top) of a juvenile Common Tern at Branched Oak Lake, Lancaster Co 15 Sep 2013 by Michael Willison. Sutton, G.M. 1967. Oklahoma birds. University of Oklahoma Press. Norman, Oklahoma, USA.